Beau’s All Natural Brewing’s 5th annual Oktoberfest, the brewery’s signature fundraising event, raised more than $75,000 this past weekend in Vankleek Hill, bringing the five year total raised to $242,000. The event was attended by more than 12,000 revelers during the two-day celebration of Bavarian culture, craft beer, independent music, and artisan food. Beau’s co-founders Tim and Steve Beauchesne were also recognized with a surprise award this weekend from the United Way. The Community Builder Award recognized Beau’s as “helping to build a stronger, healthier, and safer community for all of us.” In addition to the award, Beau’s will be added to the Wall of Inspiration located in Ottawa City Hall. The Wall of Inspiration is described as being a visible reminder to residents and visitors of the enduring commitment that individuals and organizations have made to Ottawa. “Beer tastes best when you can feel good about drinking it,” shared Beau’s co-founder, Steve Beauchesne. “I love that our little brewery has such generous and enthusiastic fans and that we can help our community by throwing a party,” he added. Evening entertainment at Oktoberfest featured award-winning and renowned independent artists Walter Ostanek, Kathleen Edwards, Sloan, The Sadies, Young Rival, The Mahones, The Balconies, and Rich Aucoin. 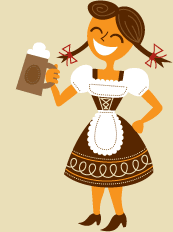 Bavarian and seasonally inspired creations were also available from more than 20 Ontario restaurants, while activities like the stein-hold struggle and spouse-carrying race tested attendees’ endurance and strength. The Members of Barleyment and Beau’s Homebrew Competition received an unprecedented 182 entries from across Canada. Jared Carlberg of Winnipeg, Manitoba was the winner of the Judge’s Choice with his “Goat of Mendes” Doppelbock, and has won the grand prize of brewing a full-sized batch of beer at Beau’s. The People’s Choice winner was Joe Rancourt with his “Death Dealer” Rye IPA.